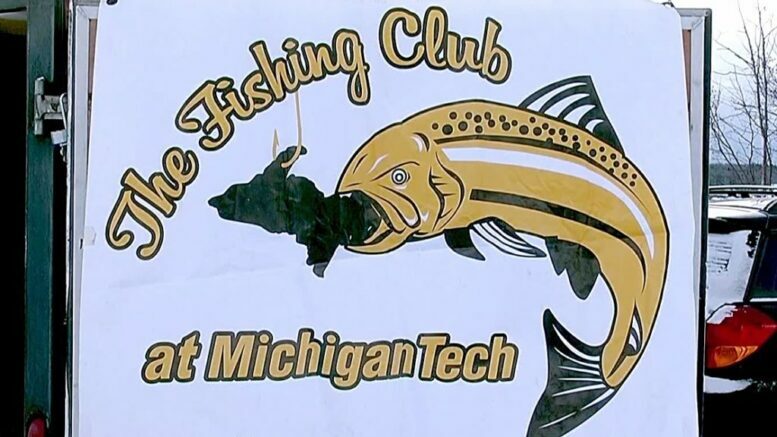 CHASSELL — The coldest weekend so far this winter may have prevented a few fisherman from making their way to Chassell Bay Saturday morning, but several toughed out the frigid temperatures an competed in an annual ice fishing tournament, held by Michigan Tech’s Fishing Club. They say a bad day of fishing is still better than, well, just about anything. That seems to be the consensus, among a couple dozen fishermen and women who are not even phased by the single digit temperature. “We’ve got about 23 anglers out, all in for longest length of five fish,” said Lukas Evans, Vice President of the MTU Fishing Club. Evans’ job Saturday was sitting here on the lake shore and waiting for someone to call in their catch. Lukas is measuring and charting each one as the biggest fish takes home some cash. For some the day is just about just having fun on the ice with friends. This group of tech students, aren’t catching many fish, but like any engineering student would, they’ve modified the protective grill on their portable propane heater, and it now makes hot dogs quite nicely, even with a slight breeze in 5 degrees. This year’s event is lightly attended. Lukas believes there’s an obvious reason for that. For others, the fish are biting just fine. Experience and some innovative tools, could be to credit. This group is using an electronic wireless transmitter that tells the fisherman when he has a bite. “So the whole purpose is just to get quick notifications and stuff,” said Gregg Haensgen, an inventor with Vulture Systems. Gregg Haensgen invented the device and now makes a living manufacturing them. With multiple tip ups on the ice, the fisherman wears a receiving collar that beeps when fish has taken the bait, and that beeper also tells him which fishing hole to check. Haensgen says that the apparatus is also used to assist trappers. Fishing is a year round sport for the club, once the ice thaws the group puts away the ice shanty, and pulls out the boat.